Are the designs painted on the wood surface ? How would I install Parquet floor or Floor Medallion? What sizes do your medallions and borders come in? What is the warranty for my product? Czar Floors uses precise CNC (Computer Numerical Control) routing machines to cut the wood. This method eliminates typical for laser-cut process burned wood edges, allows for a perfect fit of the wood pieces in the inlay. Clean, unburned sides of the wood pieces in inlay allow for a good adhesion between the pieces as well as to the plywood backer. Stone inlays are made using precise fit pieces cut by water jet from large marble slabs - unlike other manufacturers that use less expensive off-the-shelf tiles to cut parts of the medallions. Our method allows for minimum seams in the final product. No grouting or assembly required. Czar Floors stone medallions use a sturdy aluminum backer. This "space" material is light and strong, allowing for easy handling and shipping. It allows us to make large, up to 60" inlays as a single piece. Other manufacturers supply a set of precut tiles that you need to put together on-site. Stone or wood Medallions up to 60" can be made as a single piece, ready to install. Largest in the industry selection of the original designs. Great variety of available standard sizes. Many inlays are available in stock for an immediate delivery. Our products are hand-assembled by individuals who have mastered the craftsmanship of woodworking using proprietary glue, specially designed tools and technologies. 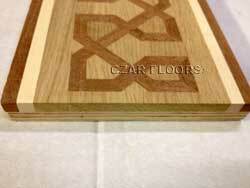 Czar Floors has the most professional , skilled team of the designers and engineers to meet any challenge. This expertise allows us to successfully design and produce unique, beautiful floors around the globe. Czar Floors designs received numerous awards for its unique work. 24/7 Installation Support. Call us anytime – day or night – weekday or weekend with any questions or installation challenges. That’s our commitment! We take pride in our work and that pride is reflected in every product that leaves our facility. Are the designs painted on the wood surface? Not at All. We do not use paint to create inlay designs. Every pattern is made up from different wood species, carefully matched by the designer to achieve the desired color effect, inlaid. From the picture below, you can see the edge of the B5 border. Top wood layer has different woods cut and inlaid to form a pattern. It is mounted on the plywood backer for 3/4" thick product. How would I install Parquet floor, Borders or Floor Medallion? We recommend to print instructions or refer the instructions on-line for your installers to review prior to installation. We offer 24/7 phone/email installation support. We are offering wood medallions in many sizes: 12", 24", 30", 36", 40", 48", 60", 70" and up. Some intricate models can not be made in small sizes. However, we can scale medallions to much larger sizes and also make custom shapes. Minimum size is listed as first in available sizes for each model. For non-round medallions, size is the major length. Square medallions are measured side-to-side. Octagonal medallions are measured corner-to-corner. If medallions are ordered as part of the project - square and rectangular medallions can be scaled to match parquet tile sizes. Most 60" and 70" medallions are made as a single piece to eliminate the seems. Larger inlays may come in several segments. All large inlays pre assembled at the factory to verify precise fit of the pieces. Border width for each model is specified in the product description. However, it can be customized from 4" to 12" for an additional fee. More intricate patterns may not be available in smaller width. Borders are supplied in equal length sections, ranging from 20 to 36 inches depending on the pattern repeat. The sections are cut in such way that when placed one-after-another, they form the continues pattern. Unless noted, the border corners are the same dimensions as the border. Parquet tiles sizes are also listed in the model description. Custom sizes available. Stone medallions standard sizes are 24", 36", 48", 60", 72" and larger. Stone medallions can be scaled to any larger size. Yes. You can specify the woods or natural stones you would like to use. There is an additional $150 fee for domestic wood substitutions. There could be an additional charge for replacing with exotic woods. If you'd like to make a modification to our existing models, please print out the detail image. Mark your changes with a pen or marker specifying element wood types. Fax the drawing toll free to (866) 631-0423. We will provide you with an estimate for proposed changes. Click here to see available woods. The same applies to the stone medallions. See available stone selection. You may place an order by using shopping cart feature or by calling Toll Free: (800) 577-2927. You may also submit your PO by FAX at (866) 631-0423 or e-mail. Credit Card payment options are: American Express, Discovery, Visa and Master Card. Accepted also PayPal, money orders, personal or business checks (allow 5 to 7 days to clear the payment), bank wire. There is a 21 ln.ft minimum for borders (in 3 ln.ft increments) and 100 sq.ft for parquet. Herringbone and plank minimum order is 200 sq.ft. At our discretion, we can accept orders below this limit. Border corners are not sold separately. There is no minimum order for medallions. We offer free shipping for standard medallions purchased at full price via standard FedEx Ground service in continental USA. Medallions up to 48" are shipped by FedEx Ground, fully Insured with Signature Confirmation. Medallions are packed in heavy duty cardboard boxes with shrink wrap and foam protectors inside. For parquet orders and large medallions Czar Floors is using the nation's largest LTL carrier - FedEx Freight. Shipping is fully insured and trackable. Our staff members will work on getting the best possible shipping rate. Large medallions are packed in the specially built crates to protect them in transit. Parquet is usually palletized, shrinkwrapped and strapped. FedEx Freight service is considered "curb side delivery." Meaning the truck will only go to the end of your driveway. Lift Gate service is included for parquet and large stone medallions. Inside delivery may be requested for an additional charge. We include Notification Service so the carrier will call ahead to make an appointment for delivery. Parquet shipping estimate is provided at the time of the order. Note: Standard Ground shipping by FedEx does not guarantee date and time of the delivery. For guaranteed delivery please request an Expedited Shipping by FedEx Express. Our staff will provide you with the quote. Unfinished stock items can be shipped within one or two business days, after payment is cleared. Please allow additional four to five business days for prefinished items. To expedite your order you may choose express shipping option. See Shipping information section above. Typical lead time to produce a new wood medallion is four to six weeks from the time of confirmed order to delivery. Stone medallions are about 6-8 weeks. Parquet production time may take from three to six weeks depending on the model and quantity. Some orders can be processed sooner. Some may take a little longer. Please keep in mind, that custom orders may take longer to complete. Actual production lead time for custom orders is starting after Czar Floors receives a written approval of the design drawing. Yes, we are happy to quote custom designs. The price is based on the time needed to draw the design and to cut and manufacture the design as well as the size and wood species specified. We will give you a quote based on a drawing or photo. If you'd like to make a modification to our existing models, please print the product image, mark your changes and fax toll free to (866) 631-0423. 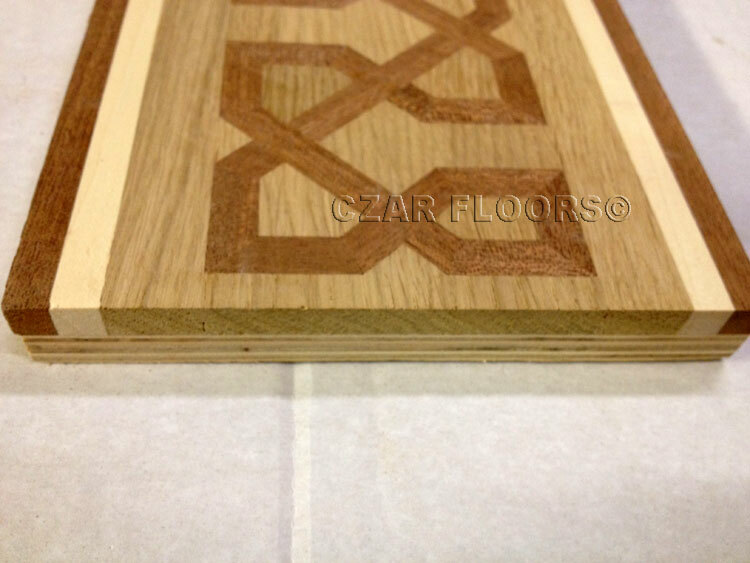 Typical process for custom orders starts with Czar Floors designers preparing a drawing with the wood map. The drawing is submitted for approval to the customer. Our designers will make necessary alterations if requested. Production will start after receiving written approval of the design. Yes, you can with some conditions. Please check our Return and Cancellation Policy. You may purchase a wood palette of the common wood species used in our products. We offer some full-size samples of our standard products. We would ship a full parquet tile or border section, prefinished to demonstrate the final look of the floor. It's a great way to insure you like the product before purchase. Even better - we will credit the sample towards the order. The cost of the sample can be in the range of $50 to $500, depending on the size and intricacy. You may order several samples, however only one sample can be credited toward the purchase. Shipping is extra. Please contact us for a price quote. We do not have a sample for every model. Some samples may be unavailable at the moment of your request and must be manufactured. Please contact us to confirm availability of the samples for a particular model. We may offer to substitute samples with a similar product. Custom products samples are quoted on the case by case basis. For general hardwood floor questions, please check NWFA (National Wood Flooring Association). Czar Floors is a proud member of this organization.